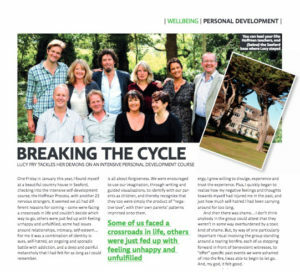 “One Friday in January this year, I found myself at a beautiful country house in Seaford, checking into the intensive self-development course, the Hoffman Process, with another 23 nervous strangers. There were moments when I felt overwhelmed, embarrassed, or just wondered what the hellI was doing supposedly learning to comfort my inner child… but, thanks to the strength of the group energy, I grew willing to divulge, experience and trust the experience. Plus, I quickly began to realize how my negative feelings and thoughts towards myself had injured me in the past, and just how much self-hatred I had been carrying around for too long. Now months have passed since my Process experience and, while the initial euphoria has worn off, I still feel lighter and unshackled. I am learning how to love and care for myself, to forgive myself for past mistakes and instead live in the present. But most of all, I have begun to truly let go of my parents’ negative patterns (a change which was set in motion by the Process but which continues on a subtle level, every day), and those they inherited from their own parents.